This Saturday is going to be a GREAT day! Not only because it’s my birthday (woohoo!) but it’s also when the Harmony of Hope Foundation is hosting its Hair4Harmony 5k Run/Walk! The event will start June 10 at 9:00 AM and benefit the Harmony of Hope Foundation, Inc., a Non-Profit 501 c(3) organization that raises awareness of children suffering from hair loss caused by cancer, alopecia, chemotherapy, and other serious illnesses. They also strive to encourage, empower and support families and loved ones thru this time in their life by providing free wigs, hats, wig care and support FREE of charge up to the age of 21. They are the only Non-Profit in the US that supports all hair loss and can support up to the age of 24 if the child is a full-time student! When you sign up for the race, 100% of your Registration fee will be donated to this non-profit organization! Not many races can say that! I’ve attended several Harmony of Hope events, and met many of the people — of all ages — who have been positively affected by this unique organization, so I always love supporting what they do. The walk/run will be held at Armco Park in Lebanon. Early registration fees are $25 and $30 after June 6 (eek! That’s tomorrow, so hurry!!) Click here to RSVP! They say you should “Make your mess your message.” That’s exactly what my friend Mara did. 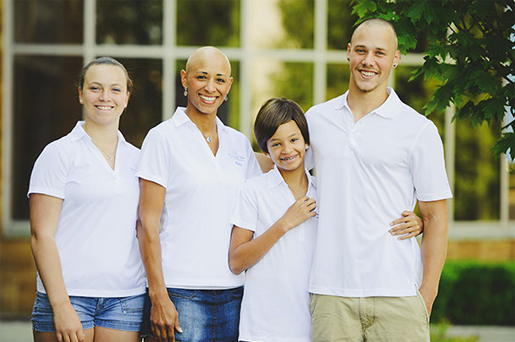 She recently launched a non-profit organization, inspired by her struggle with Alopecia for more than 28 years. Click here to check out the Cincy Chic story we just did on her organization, and below is a press release about an event we’re helping her host to support her community outreach and programming. I hope you can join us! The first event in the series is THIS Saturday! A local charity is launching a fun new event series to give local ladies the opportunity to get cute for a cause. Harmony of Hope — a locally-based non-profit providing wigs, services, products and other resources to children suffering with Alopecia, cancer, chemotherapy, burns or other illnesses — hosts its inaugural fundraiser, “Get Cute for a Cause with a TWIST,” at The Mason Pub & Grill in Mason. The three-day event series will take place June 7, 14, and 28. Tickets are $45 online and $50 at the door. Online Special Only: Admission is free when bringing two paying guests. Fifty percent of all proceeds will be donated to the Harmony of Hope Foundation on behalf of Belle of Hope Wigs and Beauty Supplies. Event attendees will enjoy shopping, giveaways, drinks and food, as well as pampering and makeup application tutorials compliments of Eboni Perkins, Independent Mary Kay consultant. In addition, each participant will receive more than $55 in Mary Kay products and be entered into a raffle to receive a $100 spa gift card, among other prizes. The events are open to the public. Seating is limited at each event. Tickets can be purchased at cincychic.com/cuteforacause. Supporting sponsors include: Cincy Chic, Tastefully Simple, Origami Owl, Snow Nails, 31 Gifts, Belle of Hope and many more. The Mason Pub & Grill is located at 753 Reading Rd Ste B in Mason. The events are from 1:00 – 3:00 PM, with Open Shopping: 12:00 – 1:00 and 3:00 – 4:00 PM on June 7, 14, and 28.